In the previous tutorial, we took a brief look at the features in Adobe Camera Raw II (ACR II) for adjusting tonal range, contrast, and brightness. For some images, all you need are a few adjustments with ACR II and your global adjustments are complete. You can even do capture sharpening and noise reduction in ACR II. Some images present greater challenges. The Gerber Daisy in Figure 1 is an example. I took the shot in bright sunlight. I was afraid of burning out the saturated yellows, so I underexposed the image: rather severely, it turned out. 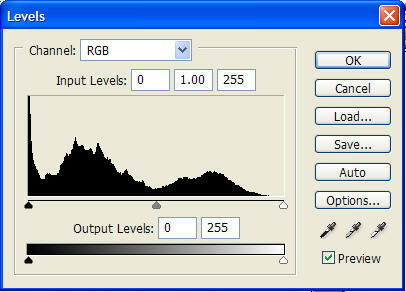 I should have paid more attention to the histogram and less to the image on my Canon 10D. Figure 1. The RAW image of a Gerber Daisy prior to basic adjustment with ACR II. 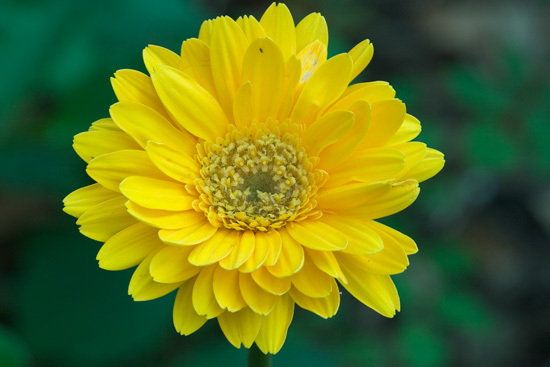 Believe it or not, there is a bright yellow Gerber Daisy just aching to emerge from Figure 1. Take a look at Figure 2. Replace color was not used to substitute those bright yellows for the reddish, orange colors in Figure 1.
basic adjustments with Levels, Curves, etc. I began my adjustments in ACR II. The only adjustments I made were basic ACR II adjustments to white balance and exposure on the Adjust tab. I started with a white balance adjustment, lowering the temperature from 5250K to 3250K. The Tint slider was moved from +37 to -20. Exposure was increased +1 1/3 stops. This stretched the tonal range slightly, brightened the image considerably, and moved the flower blossom quite a way in the direction of yellow. I left myself headroom for editing with Levels and Curves. The tonal range could still be extended in the direction of the highlights. Some photographers might be content with the result in Figure 3. Compared with the unadjusted RAW image in Figure 1, the image above is a marked improvement. We can do better, however, with a little more effort. The Levels dialog is Photoshop is a powerful tool for adjusting your images. You use Levels to transform existing pixel values (Input) into new output values (Output). The Input values allow you to adjust contrast and brightness and to stretch the tonal range. The Output values compress the tonal range and also affect image contrast. To get the most from the Levels dialog, crop out any unnecessary black or white borders. If you leave a border, it will have a strong influence on the display of the histogram. The first step with the Levels dialog is to set the white-point and black-point. Working with 16-bit images is a big advantage when you stretch and/or compress the tonal range of an image. If you work in Photoshop CS, you should also use a Levels adjustment layer for your work. That way, you can easily tweak the settings later. Figure 4. The Photoshop Levels dialog. The black and white Input sliders adjust image contrast. You can pull the appropriate slider or you can enter a number directly in the appropriate box for any Levels value. The white Input slider takes pixels below 255 and converts them to 255. As you move it toward the center, pixels to the right are converted to 255 and values to the left stretch all the way to 255. Similarly, as you move the black Input slider toward the center, pixels to the left are set to zero and pixels to the right are stretched toward zero. 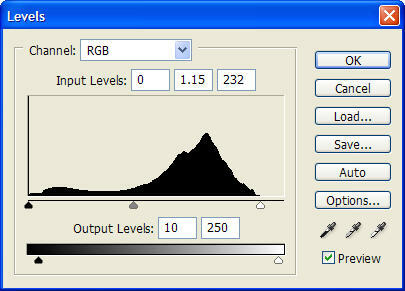 Because you are stretching tonal values with the Input sliders, gaps can appear in the histogram. Wholesale Levels adjustments, especially if you work with 8-bit images, can result in visible posterization. So, be careful. For tonal adjustments, you typically adjust the RGB channel. For color correction, you do most/all of your work on individual channels. When you adjust the white-point using the RGB channel, your image highlights will be neutral. Same result for the shadows when you adjust the black-point using the RGB channel. What if you do not want neutral highlights (or shadows or midtones)? In that case, you need to adjust the endpoints for the each of the color channels separately. If you have a nice warm cast from early morning sun, you can keep that warmth by working on the separate color channels. Finding the white-point can be a challenge on a computer monitor. Photoshop makes it easier. Hold down the Alt/Option key while dragging the white Input slider and the image will turn black. This is the Photoshop clipping display. As you continue to move the slider toward the center, part of the display will turn white (or another color if just one or two channels clip at that point). This is the brightest highlight in your image. Release the Alt/Option key. This will set the white-point to the brightest point in your image – which is often a specular highlight. Specular highlights are those tiny, bright highlights that you are likely to see on shiny objects like glass, chrome, water drops, etc. If you can identify a feature on the image that should be bright white, you can instead click on the white eyedropper and then click on that point on your image. Photoshop will read the value of the underlying pixel and set the white-point accordingly. If you aim wrong, just click on another image feature. Adjusting the black-point is a similar operation. Here you are selecting the darkest pixel and making it 0. Holding down Alt/Option as you pull the slider toward the center will help in identifying the shadow point. This time, the clipping display will turn white. As you pull the slider, features of the image will begin to appear in black (or another color, if only one or two channels clip at that value). Stop pulling the slider and release the Alt/Option key and you have your black-point. If you can identify a feature in the image that should be neutral black, you can also use the black eyedropper. What if your brightest pixel should not be 255? Instead, it should be some gray tone. If you print this pixel value as white, your image can look splotchy. Or, perhaps your darkest shadow was not pure black. You need a slightly lighter tone. The Output sliders compress the tonal range so it does not extend from 0 to 255. If you know your brightest highlight should be 242 (5% gray), setting the Output white value to 242 will keep the highlight from going totally white. You can do the same for your shadows. Most printers cannot reproduce distinct tones all the way from 0 to 255. Depending on the combination of printer, paper, ink, and environmental conditions (e.g., humidity), your printer may not be able to print distinct tones between 0 and 8-10 or between 242-250 and 255. You can adjust the Output black and white values to reflect your printing limits. Doing so avoids stretching the data unnecessarily and ensures your grays are all reproducible. If your image does have specular highlights, however, you need to allow those pixels to “blow out” to the color of the paper. Not all the way to 255, but slightly past the limit of your printer. The gray Input slider is for the gamma setting. Sometimes photographers refer to this as the midtone slider. Moving the slider to the left will lighten the image; moving it to the right will darken the image. The white-point and black-point are unaffected by changes to the gamma slider. When you adjust the gamma slider, you are telling Photoshop which Input level to make midtone (128). 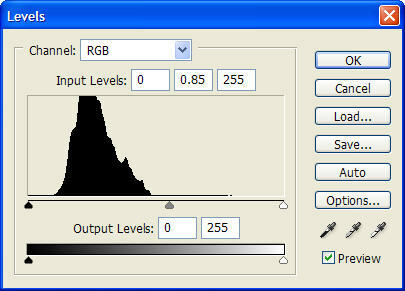 Adjustments to the gamma value for the RGB channel determine what should be midtone gray (50% gray). If you can identify a feature in the image that should be 50% gray, you can use the gray eyedropper to set the value. Be careful with the gamma slider. Extreme changes invite posterization. You can wind up stretching one part of the tonal distribution a lot and compressing the rest. After a bit of Highpass Filter capture sharpening, my retouching began with two separate Levels adjustment layers. I wanted to increase the contrast between the flower and the background, and I wanted that contrast boost to be independent of the adjustments I wanted to make to the background and to the blossom. I made a mask to control where the two Levels adjustments were applied. Figure 5 shows the result. Figure 5. Two separate Levels adjustments, one for the background and another for the yellow Gerber Daisy. I brightened the yellow flower blossom by adjusting the gamma slider from 1.0 to 1.15. Pulling the highlight slider from 255 to 232 also added a perceived increase in brightness. Figures 6a and 6b. The Levels adjustments for the flower and for the background. Creating a mask to separate the flower and the background was quite simple. The yellow of the flower and the greens and blacks of the background were distinct. • Their color contrast was so great that the Magic Wand was the ideal tool. I set the Tolerance to 50 and was able to isolate the background with just a couple of mouse clicks. • I switched to Quick Mask mode and used a 1 pixel Gaussian Blur to feather the edges of the selection. I prefer Quick Mask and the Gaussian Blur filter for feathering selections rather than guessing with the Select | Feather menu item. • After feathering, I left Quick Mask mode, went to the Channels palette, and saved the selection as an alpha mask. • I then inverted the mask by using the Duplicate Channel command and selecting the Invert option. This gave me two masks. I loaded each in turn as a selection and added new Levels adjustment layers: one for the flower and one for the background. Each selection was automatically converted to a layer mask. This is an article in a series about tonal range, contrast, and brightness. So far, we have focused on tonal adjustments, leaving color correction for a future discussion. The bright yellows evident in Figure 2 could not result just from adjustments to the tonal nature of the image. Some quick and basic color adjustments were also required. Some readers may find it helpful to get a feel for the overall workflow for correcting an image like the one in Figure 1, so I’ll digress a bit. If you prefer, jump ahead. After the Levels adjustments, I made a new layer by selecting the “Create a new layer” icon at the bottom of the Layers palette. The new layer was filled with transparency. Pressing alt-ctl-shift-e (option-command-shift-e on the Mac) merged all of the visible layers into this new layer. I used the Healing Brush tool to correct damaged petals and other distractions. I also used the Lens Blur Filter on this layer. The mask for isolating Levels changes to the background served as a Depth Mask. The Lens Blur Filter helped to soften the background slightly, focusing more attention back on the flower itself. Figure 8. The image after quick adjustments with Color Balance and Hue/Saturation. The color adjustments were accomplished by two adjustment layers: a Color Balance adjustment layer and a Hue/Saturation adjustment layer. 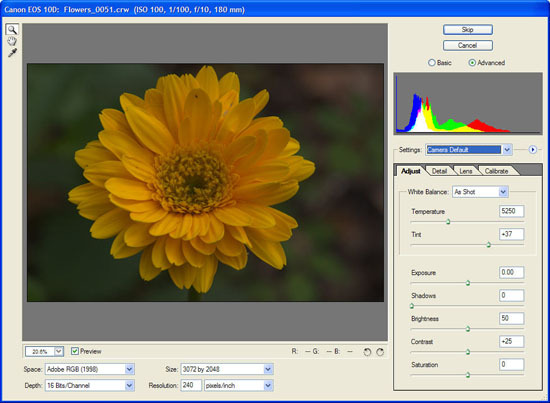 • The adjustment for Color Balance set the Color Levels slider for Yellow/Blue to -55 for the Midtones. Preserve Luminosity was also checked. • The Hue/Saturation adjustment was limited to the Yellows. Saturation was set to -15 and Lightness to +10. To be candid, I considered stopping at this point. I also wanted to discuss Curves adjustments in this installment. So I decided to press the envelope a bit and further brighten the Gerber Daisy with a Curves adjustment. Many photographers new to Photoshop feel intimidated by the Curves dialog. It is a complicated looking dialog. Curves is the ideal Photoshop tool when you want to affect selected tones in an image. Levels sets the tonal range for the entire image and can also make global adjustments to contrast and brightness. Curves lets you isolate specific tones, like the midtones or the highlights and affect them in different ways. You can, for example, increase contrast in the midtones while keeping the highlights and shadows unaffected. You get five points to adjust with Levels. Curves gives you up to sixteen. You can toggle between working with tonal values (0-255) and dot percentages (0-100) by clicking the tiny triangles on the Curves dialog (highlighted in red below). You can change between a 4x4 grid and a 10x10 grid by Alt/Option clicking on the graph itself. to click to change between tonal values (0-255) and dot percentages (0-100). 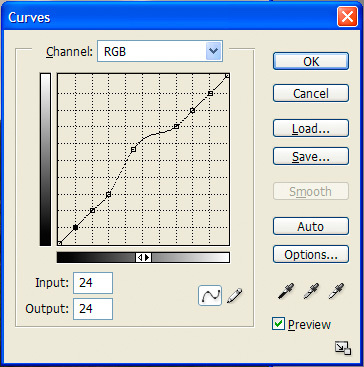 The Curves dialog starts out with a diagonal line. You can add points along the diagonal to keep the line fixed at particular points. You can also pull the line to a new position and cause it to curve (hence the name, “Curves”). The classic example is an “S” curve to increase contrast. Figure 10 shows one possible high contrast “S” curve. I started by fixing the line at 126. Then I pulled the highlights up and to the left and the shadows down and to the right. To be precise, a tonal value of 50 was set to 25 and a tonal value of 202 was set to 228. This brightens the highlights and darkens the shadows while not affecting the midtones at all. In fact, midtone 126 cannot change. Figure 10. A classic “S” Curves setting to increase image contrast. Adjusting just one point in the Curves dialog affects not only that tone; it also affects adjacent tones. The more extreme the change, the stronger its effect on adjacent tones. As Mitch says this is already a strong S-Curve. More on S-Curves can be found here. The typical solution is to add a set of anchor points. This keeps the number of affected adjacent tones to a minimum. (Compare Figure 11a and 11b.) There are limits to that solution, however. First, the Curves dialog only supports a small number of points. Second, because we are adjusting a curve, it is possible to get some twists and bends from extreme changes that can cause some of the adjacent tones to posterize or undergo other severe changes. adjustments limited to a narrow range of tones. I used the mask for isolating changes to the blossom as a layer mask for the Curves adjustment, since I wanted Curves to affect only the flower and not the background. Masks are one solution for limiting the effects of Curves adjustments. I’ll be addressing some other techniques in future tutorials in this series. Figure 12. Almost complete. Just some finishing touches remain. 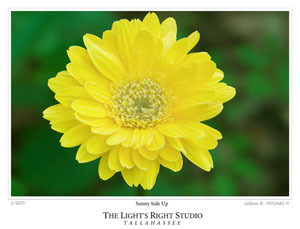 The upward curve in Figure 9 brightened the flower, affecting the midtones more than the one-quarter and three-quarter tones, and affecting those more than the shadows and highlights. I pulled the input value for 108 up to 147. Pulling the line in Curves downward and to the left would have the opposite effect and darkened image features. The result of the Curves adjustment is a bright yellow Gerber Daisy! I considered the result in Figure 12 to be nearly complete. I decided to apply a bit of localized sharpening in the center of the flower. The Canon 180mm “L” Macro is a great lens. Tack sharp from center to edge. Wonderful contrast. Great bokeh. To emphasize the sharpness, I applied some clocalized sharpening. 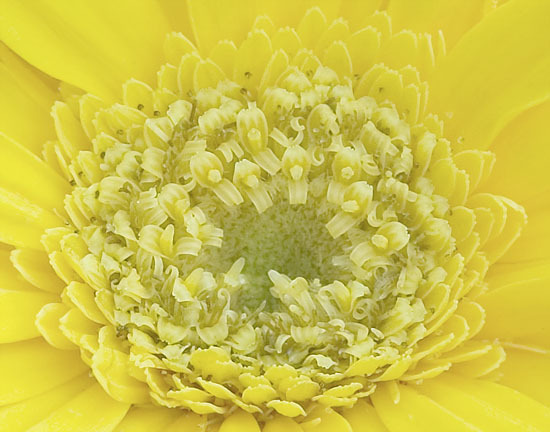 Localized sharpening is easy for an image like this Gerber Daisy. I created a new layer. The alt-ctl-shift-e (option-command-shift-e on the Mac) shortcut merged all of the visible layers. Setting the blend to Luminosity avoided any color shifts during the sharpening. Paying attention to the center of the flower as I adjusted the settings, I applied Unsharp Mask Filter (350, 0.70, 2). A Conceal All layer mask added to the sharpened layer hid the sharpening effect temporarily. I grabbed the brush tool with a soft edge, white foreground, and 100% opacity to paint the sharpening back into the central portion of the flower. I decided to tone down the sharpening effect a touch by reducing the opacity for the layer to 75%. 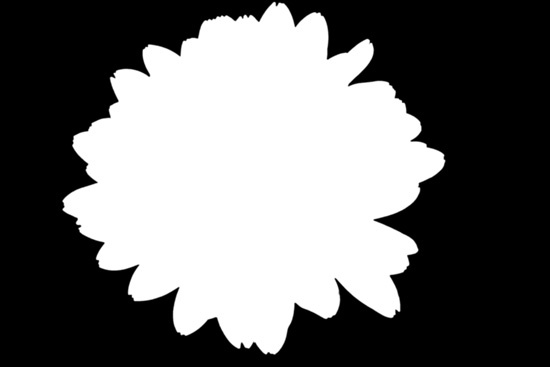 Figure 13 is a 100% crop of the center of the Gerber Daisy. you need it without over-sharpening the rest of the image. After localized sharpening, I decided to apply a quick round of dodging and burning. I had used a Photoflex 5-in1 reflector to provide more even illumination for the shot. The flower was standing in broad daylight, however. The silver reflector reduced the shadows and highlights. It did not remove them. I prefer to use an Overlay layer filled with 50% gray for my dodging and burning. Then I can use a soft edge brush and black or white at low opacity to build dodge and burn effects over successive brush strokes. The only remaining touch was to add a gallery print effect. Voila! I had the result in Figure 14.
colorful image of a Gerber Daisy. 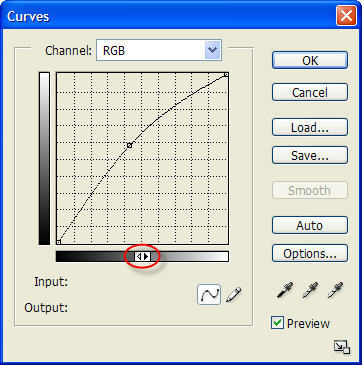 This tutorial has covered the basics of the Levels and Curves dialog. It has been a quick introduction. Hopefully it will encourage you to use both tools if you’ve been reluctant. I’ve also shared a bit of my workflow for an image of this sort. If you are new to Photoshop, I hope this tutorial will encourage you to work and rework images you consider hopeless. If you started with the RAW image back in Figure 1, you might be tempted to abandon it. Photoshop is a great tool for extracting the numerous possibilities waiting inside each RAW image.